A summer Sunday brunch never tasted this good! 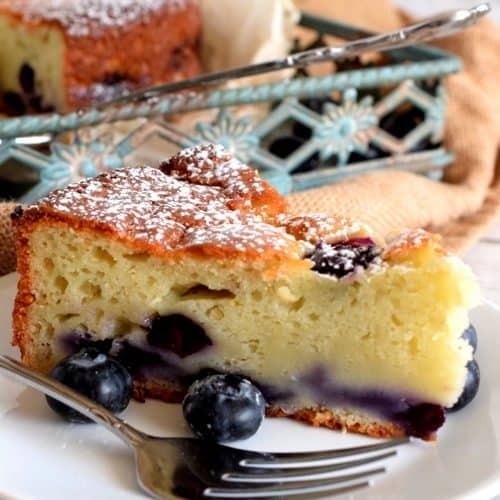 Blueberry Yogurt Cake is light and moist, super summery, and a perfect addition to any brunch table! Preheat oven to 350 degrees. Lightly grease a 9 inch cake pan with non-stick cooking spray. Set aside. In a large mixing bowl, add the yogurt, eggs, vegetable oil, sugar, and vanilla extract. Use a hand-held mixer to blend until well incorporated. Blend on medium speed for a full 4 minutes. Add the flour and baking powder. Blend until well incorporated. Add 1 1/2 cups blueberries and gently fold them into the batter using a rubber spatula. Pour the cake batter into the prepared cake pan. Top the cake with the rest of the blueberries and bake for 40 minutes, or until a toothpick inserted into the middle of the cake comes out clean. Allow the cake to cool for 10 minutes in the baking pan before carefully flipping it out onto a wire cooling rack to finish cooling. Dust with confectioner's sugar and serve at room temperature.